Isn't it time individuals stopped pretending they're companies? One of the trends we've been seeing with the proliferation of independent analysts, bloggers, consultants, journalists and other pundits, is for many of these characters to launch their own "firms", when the product is, really, just them. Or them and a few freelancers they could tack on to their website to make them look like an actual company of people. Now, if an individual was actually planning to grow a company over time - and genuinely adding real staff which does more than organize their mailshots, calendar or spell-check their reports, they can be forgiven, however, there are far too many people out there masquerading as company CEOs when they really don't have a "company" to run. It's just them. And some freelance admin person. When I saw my old friend, Chris Lewis, announcing an exciting conference "The Great Telco Event" he is running in London this November, I was amazed at the sheer number of "companies" I have never heard of from a pretty impressive collection of individual speakers (many of whom are telecom analysts who found themselves going independent after that market commodotized and their firms couldn't make enough profit out of them). Now, I have heard of most these experts as individuals, but these weird company names? I mean, why bother? Aren't they just confusing their clients and prospects? Aren't we in a new generation of individuals promoting themselves? Isn't the real brand equity in their personal brands as opposed to some obscure name they trumped up? And credit to Chris - one of the great all time telecom analysts, who has recently branched out as "Chris Lewis Insight". Now... when prospective clients want to hire Chris, they want him and his services - and his handsome face. So why not brand his venture under his own brand? Kind of - I wanted to use a successful blog as the initial platform to grow a research firm, and that is exactly what we achieved, and it quickly culminated with us abbreviating the blog name to HfS to sound more corporate (try getting meetings with CFOs when your firm is called "Horses for Sources"). My friend Ray Wang had a vision of assembling a "constellation" of star analysts, and that is what he has achieved with some great additions like Holger Mueller and Peter Kim at Constellation Research. Now, if myself of Ray had never actually bothered to build genuine companies of experts, we should just call ourselves "Fersht Inc.", or "Wang and Assocs LLC" (or whatever). And if the whole of HfS decides to quit on me tomorrow and I decide I can't be bothered to replace them, I'll probably do just that! 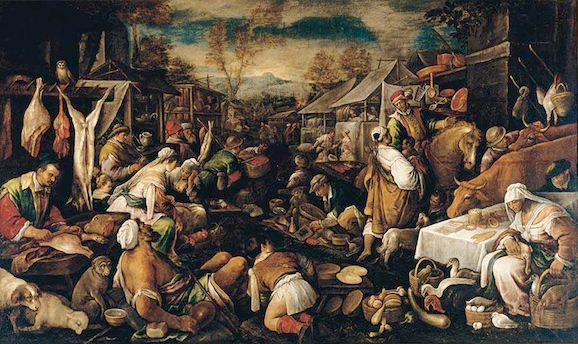 When you go on LinkedIn these days, it reminds me of those market scenes in historical movies and paintings, where people are selling their services and wares openly to all the town (B2C) and the other merchants (B2B). People are marketing their skills and competencies before their corporate identity. In fact, I find I have to click on someone's actual profile and scroll down a couple of screens to find out who employs them these days. Who cares if you are an SVP at Blah Blah Bank... I want to know what you're good at! And on twitter, many people do not even bother to add their company name in their profile at all. We can lament the shortage of Digital talent within corporations, but maybe that's because the next wave of "Digital" skill and creativity is coming from outside of the creaking corporate firewall. Good post, personal brands are rampant. Related question: How long was Mr Peter Kim at Constellation? Phil - thank you for calling this! I think analysts try to do it make their research look more credible. Consultants do it because they worry they won't be taken seriously by clients if they are seen as solos. But you are exactly right - clients want to buy from the smart individuals and having them use obscure company names is actually diluting their value, not adding to it. I think some analysts are keen to create the facade they have resources behind them. "Make Hay While the Sun Shines" - that's the first thought which comes to mind Also it may highlight an opportunity area which these individual "analysts" are exploting. The well know, the popular analyst firms - CHARGE TOO MUCH? And also that buyers of services are out for cheaper,low cost or freemium? @Yatin - it's the natural evolution of research as legacy analyst firms cast off expensive old-guard (and often well regarded) analysts to replace them with cheaper younger staff which focus on the company brand and not their personal brand. Hence, you end up with a plethora of smart individual analysts going indie and making a living doing their craft for much lower prices than the IDCs and Gartners. For white papers, smart marketeers already know most end-users don't read them in any case, so why not do them for cheaper with independents than pay top dollar for the big brands? Absolutely agree with you " corporates want to reduce their core and contract for expertise as and when they need it. At the same time, an increasing number of individuals are shunning the corporate treadmill to enjoy the fruits of being self-employed – either as themselves or their pretend company. And those individuals are picking up new skills – often without realizing it – that makes them more valuable professionals – they learn how to market themselves well, how to hustle for clients, how to think outside of the box, how to differentiate their ideas and personas… - See more at: http://www.horsesforsources.com/individuals-companies_071014#sthash.l8WhJ734.dpuf"
As we move into a world where Employment Contract Hire is becoming the norm it is essential for People to establish themselves as a Brand. Doing this requires considerable digital fluency thereby escalating the individuals skill set and value. Agree, and see it happen very often in Corporate America (not sure of other geographies). Increasingly firms tend to reduce core, and hire expertise on long-running contracts. As a consultant this is extremely valuable for me, as I deliver individually and gather feedback as a unit of skill. Doesn't matter if you call yourself a founder-CEO or an independent consultant. The only help that comes with an organisational affiliation is the work-permit (yes, this is a concept for resources from 'other' parts of the world : ) ). Well, that is the beauty of "free enterprise", isn't it? You, me or anyone else can start a business. and succeed or fail "by the sweat of our brow". "Now, if an individual was actually planning to grow a company over time – and genuinely adding real staff which does more than organize their mailshots, calendar or spell-check their reports, they can be forgiven, however, there are far too many people out there masquerading as company CEOs when they really don’t have a “company” to run. It’s just them. And some freelance admin person." "Now, if myself of Ray had never actually bothered to build genuine companies of experts, we should just call ourselves “Fersht Inc.”, or “Wang and Assocs LLC” (or whatever)." The writer obviously doesn't understand the term, "Sole Proprietor". In such a role I am my business and my business is me. It is one of the few remaining rights we Americans can enjoy in this country. Also, at my age the level of certification, education and experience I bring to the market and the table exceeds that of most small and mid-level business operations. Most of them can't match my expertise with an entire department. My experience, knowledge and skills makes me an ideal contractor for short term technical projects. Those same skills makes me a poor employee because I know my business and my field of expertise better than some 25 year old HR witch or a numb skull middle manager. Finally as an independent contractor I don't need to be enrolled in a company health care, retirement or benefit plan. I am a proud hired gun and I take of myself. All I need to know is what is the job, what is the mission, what are the deliverables and what is the deadline? I'll take it from there. As usual your analysis is sharp and insightful. However, as a recently independent owner of a one-person firm, I do think there are some considerations you may be missing or undervaluing. It's difficult to have a private persona and a public one if your name is your brand. For those of us whose lives are about more than our work, that's a good reason to create a separate brand. And you can make fun of a one-person company having a President, but it's amazing how much deference people pay to titles, even meaningless ones.